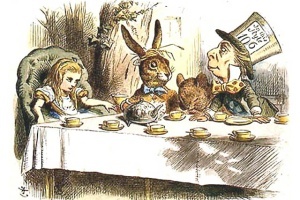 Yes, life does seem like a mad tea party sometimes, doesn't it? There’s nothing like facing your own mortality to put things in perspective for you. Irritants that seemed so important before become inconsequential, and other things that we’ve taken for granted — like the sun shining in a blue sky — may suddenly appear to you like the miracles they truly are. Of course, we all know that we are mortal beings, at least in body and mind, if not spirit. And we all think about death often over the course of a lifetime: we know it is the inevitable conclusion of every living thing on Earth. We try not to be obsessed with it, and we often make light of it — and in the lonely dark of night, we sometimes curse the fact that man knows his mortality. Sooner or later, though, a health scare moves it all to the front burner for everyone — unless you die suddenly and unexpectedly. We all have health scares over the course of a lifetime that if left untreated could be the thing that kills us. And, thankfully, modern medicine can heal us over and over again. But the time between, say, the first note of suspicion to further tests and diagnosis can lead to much anxiety . . . and google research on all possible scenarios. Consider a woman who has had a routine mammogram and gets a callback for an additional one and a breast ultrasound. In the vast majority of cases, everything turns out to be OK. But the period between the actual telephone call and the return visit can be a time of high anxiety, with the aforementioned renewed perspectives on mortality. For many women, the anxiety sets in before they’ve had a mammogram. They discover a lump while showering, and from that moment on, the mortality issue is no longer something to make light of. Yet, billions of people and creatures have come and gone already on this planet, and billions more will die within the next century. The life and death cycle is a natural course of the universe, just as our busy day gives way to the slumber of night. As above, so below. So, why do we fear death so much? Why do even the most spiritual among us worry about dying? P.S. No, I do not have a terminal illness, at least not that I know of. Previous Previous post: To slurp or not to slurp? Well, life is a death sentence. A few months ago I saw myself in a full-length mirror, and, damn, I AM old. Really, I did not recognize myself at first – all I saw was a pathetically old man. I realized that except for my older brother who was recently diagnosed with stage-4 throat cancer, I have outlived every one in my immediate family who has died. Come to think of it, my parents, my cousins, my aunts and uncles all died from consequences of smoking. (My younger brother and I never started). My pending death is at the forefront of my thoughts. I am nearing 70 and I plan to see my 100th birthday, but I can’t stop thinking about leaving sooner. I am setting up “last minute notes” aid my wife in the transition. It has all my passwords and account log-in information. It has suggestions of what to do with my video gear, my ham radio stuff, my computers, and a basement full of power tools. We are planning to see a lawyer soon to get a will prepared (especially since my wife’s employer offers legal services as a benefit). We all hope to live to a ripe old age, and then complain when we actually are old. I have heard people say no matter how old they get, they never want to die — unless they are suffering. Then death becomes a liberation. On that latter note, some spiritual people see death as liberation from the wheel of life. They believe in reincarnation, but they don’t want to come back. They want nirvana, or perpetual bliss. So, earthly life is seen as some sort of trial for the soul. That’s true. The “how” is a great concern. I suppose it is alleviated somewhat by legal suicide in Canada now, i.e. if you are terminally ill, you do have the right to doctor-assisted death. That could make an interesting post. How about: by a peaceful lake in the Laurentians, under the influence of some nice psychedelic mushrooms or mescaline or even pot. I stayed in the city, at the YWCA hotel. But it is beautiful today (Wednesday), so mild. We are all dying. Life is a sexually transmitted fatal disease.